Let’s face facts; the majority of us will never own a high-rise condo, luxury yacht, or keys to a Ferrari –or any other sports car included in that astronomical price range for that matter. It’s hard to justify the amounts being asked for many luxury items, and to be honest part of the appeal for yachts, or expensive cars is their exclusivity. These are generally toys for the super wealthy – status symbols for those that can spend prohibitive amounts of money on luxuries the vast majority of us cannot. Or are they? A new website called Jointli is looking to change all that. Jointli essentially allows people to come together and own an assortment of luxury items collectively. So if the idea of co-owning a beach house, private jet — even a Ferrari appeals to you, Jointli is aiming to facilitate that. Users can search for potential co-owners in their area, sign agreements and manage these time-shares with ease. 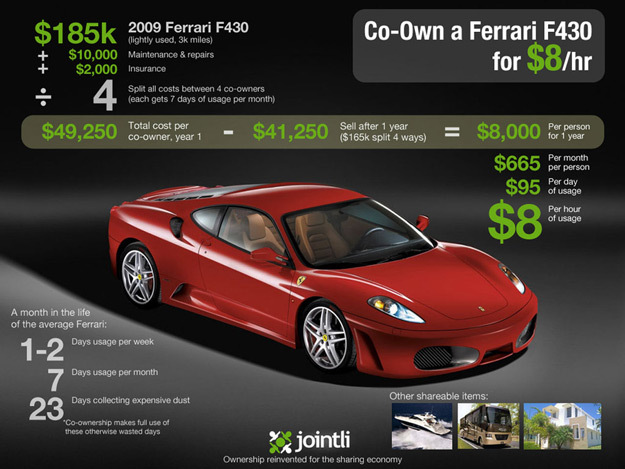 One of the examples broken down on Jointli’s site is that of four people co-owning a Ferrari F430. According to the math, owning a 2009 Ferrari F430, used, with less than 3k miles would set your bank account back $8,000 a year, $665 per month, $95 a day, or $8 per hour of usage. Now of course, $665 a month can nab you a set of pretty sweet wheels, so while we understand what Jointli is aiming for, bringing luxury and otherwise unattainable items to the masses, it goes without saying that perhaps some of these luxuries may not be worth the price of admission even with others subsidizing the cost. Another factor worth considering is the logistics of it all, what would one do if multiple owners wanted the car at the same time? Not to mention the added (and high) cost of maintenance, insurance, or repairs if the Ferrari were to incur any damage. While we understand that not everything lends itself well to co-ownership, there still appears to be many variables left to consider, making the idea of sharing such luxury items like a Ferrari seemingly unrealistic, and leaving us a tad bit skeptical . Still, if the idea of co-owning a Ferrari or a number of other luxury items is something that you would consider — then Jointli just might be for you.